We all love shopping and buying the products that we love, but only a few people understand the impact that design has on influencing sales. Design helps to sell products and services by using effective visual communication that awakens interests and motivates sales. Shopping is the art of persuasion, and most retailers would agree with me; all the visual elements around the stores directly and indirectly motivate the customer to react, and that’s where visual merchandising comes to play. Visual merchandising is a method of developing floor plans and dimensional displays to maximise sales. This type of advertising is used in stores for both goods and services to highlight their features and benefits. Graphic design fuels visual merchandising to allow the message to go beyond verbal communication in an innovative and creative way, motivating customers to buy. Visual merchandising allows for both goods and services to be displayed to highlight their features and turn a passive looker into an active buyer. The purpose of such visual merchandising is to attract, engage, and motivate the customer towards making a purchase. Graphic design plays a vital role in developing and maintaining a consistent brand strategy that positively influences consumer behavior and allows visual merchandising to be flexible. 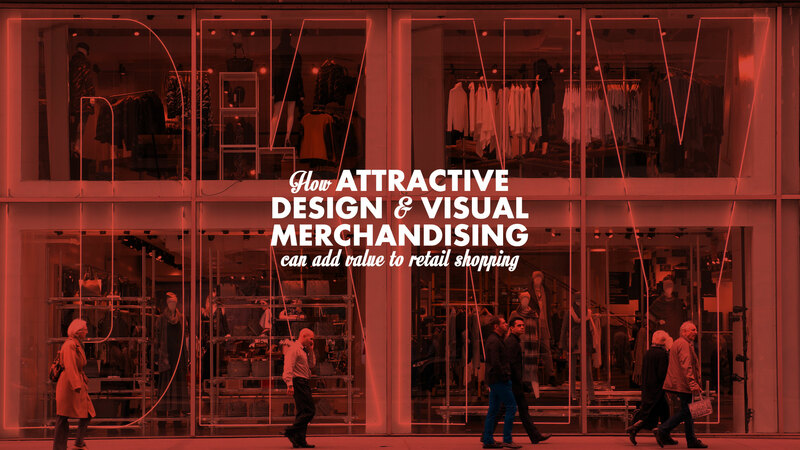 Visual merchandising augments the retail design of a store, and is one of the most vital stages in prepping out a store in a way customers find it attractive and appealing. Visual merchandising is an important part of product and brand management, as well as marketing. It involves attracting customers to retail stores and presenting merchandise in a manner that will appeal to consumers. Any companies that manufacture or market products through retail establishments must utilise effective design and visual merchandising techniques in order to win the customer. Visual merchandising is the art of presentation, which puts the merchandise in focus. Hence, we conclude by stating that visual merchandising has emerged as an important factor that helps to boost sales and ultimately maximise the level of profit for retailers.